Our Ex-Display Items have been previous residents in our London Showroom. Handmade by our skilled craftsmen they can be delivered for free nationwide within 7 days. So, if you don’t mind the odd small bump or bruise and fancy a bargain, then these are for you! 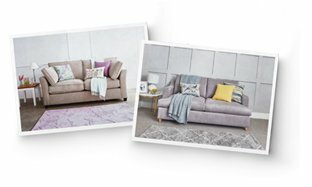 Our clearance range of sofa beds, sofas, love seats, armchairs, beds and accessories have all been carefully handmade by our skilled craftsmen and upholsterers with over 35 years’ experience of quality British craftsmanship. At Willow & Hall, we only use the finest solid hardwood in our frames so each one is built to last for up to 10 years – you have our guarantee on that. Plus, if you’re unsatisfied with your item for any reason, let us know within 30 days and we’ll come and collect it and offer you a full refund.